The LifeSize Presentation Pro is a custom made touchscreen podium with an integrated angled touchscreen. It’s designed for standing sales presentations, where a more informal or relaxed interactive customer experience is preferred. 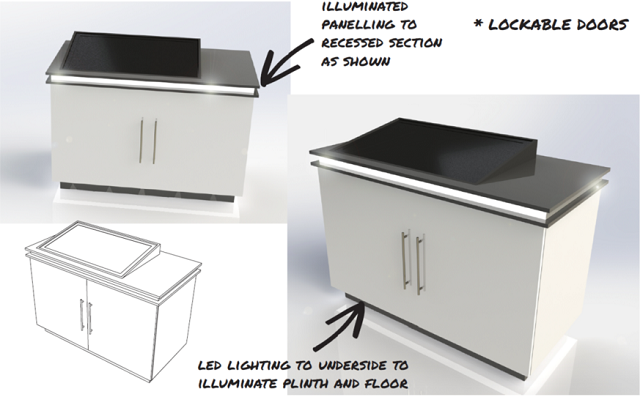 In this design, we have flat surface space to the left of the touchscreen for drinks, brochures or sales paperwork. Underneath is a locking compartment, ideal for sales brochures, marketing materials or other items that needs to be safely locked away. LED lighting can be included for additional WOW factor in your sales showroom. This design features locking castors (wheels) to allow the pod to be moved around more easily.